The patient is an 87-year-old gentleman who presents to his primary care physician for shortness of breath. He is discovered to have a right pleural effusion, which is tapped, and recurs. The patient is referred to a pulmonologist who sends a third effusion for cytology. The cytology is interpreted as malignant. Radiology studies demonstrate that the right pleura are studded with numerous nodules ranging in size up to 2.1 cm. The patient undergoes biopsy of multiple nodules. 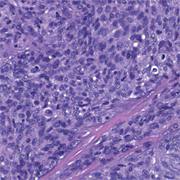 Histology reveals a malignant neoplasm consisting of spindled and epithelioid cells. Areas of necrosis are present and mitotic figures are readily identified. 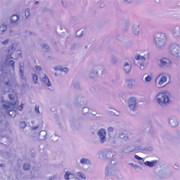 Two (of four) specimens show foci of osteosarcomatous differentiation. 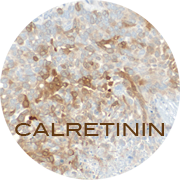 Immunostains show that the neoplastic cells are positive for panCK, Calretinin, CK5, and thrombomodulin and negative for WT1, Ber-EP4, pCEA, and TTF-1. The tumor morphology and phenotype are compatible with a diagnosis of malignant mesothelioma with epithelioid and sarcomatoid differentiation.